“There are several excellent books that have been written about environmental health concerns and the current debate linking pervasive exposures to the growing incidence of chronic and acute illnesses afflicting American society today. We highly recommend the insights and research offered by the following authors who have diverse perspectives and expertise to lend to our understanding of these complex issues. 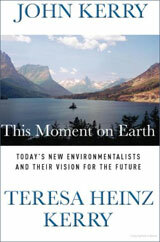 This Moment on Earth: Today’s New Environmentalists and Their Vision for the Future by John Kerry and Teresa Heinz Kerry. This inspiring collection of stories about citizens who have stepped up in their communities to fight back against environmental destruction provides a snapshot of some of the major issues we face in America today – and what ordinary people are trying to do about them. Information in this book ignited awareness about toxic chemicals in cosmetics that evolved into The Girlcott in San Francisco. 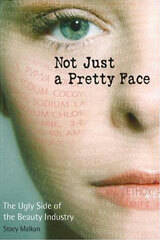 Not Just A Pretty Face: The Ugly Side of the Beauty Industry by Stacy Malkan. Lead in lipstick? 1,4 dioxane in baby shampoo? How is this possible? Simple. The $50 billion cosmetics industry is so powerful they've kept themselves unregulated for decades. Malkan's expose uncovers the industry's toxic secrets and serves as the inspiration to launch The Girlcott. "It is incredibly exciting to see an idea spring from my book and become a reality. The Girlcott is designed to raise awareness about the importance of safe cosmetics and to engage the public in taking action. Together we can give the beauty industry a makeover! As an author and co-founder of the Campaign for Safe Cosmetics, I wholeheartedly embrace The Girlcott and will look forward to witnessing this movement on April 18th!" 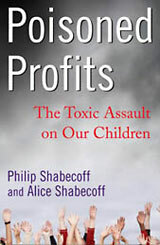 Poisoned Profits: The Toxic Assault on our Children by Philip and Alice Shabecoff. The Shabecoffs reveal that the children of baby boomers — the first to be raised in a truly "toxified world” — have higher rates of birth defects, asthma, cancer, autism and a frightening range of other neurological illnesses from ADHD to mental retardation, and other serious chronic illnesses compared to previous generations. Described as "powerful, unflinching and eminently readable" this book is a national wake up call to protect our country´s vulnerable children from chemical contamination. "As the authors of Poisoned Profits: The Toxic Assault on our Children, we fully endorse The Girlcott as an exciting way to increase awareness of the environmental health issues that threaten Americans today. As parents and grandparents, we will use The Girlcott Web site to educate our family. We applaud the efforts of moregreenmoms (www.moregreenmoms.com) to raise the visibility of the way toxics now pervade our daily lives, and we hope The Girlcott becomes a powerful symbol that inspires wise consumer choices, civic action, corporate innovation and governmental oversight in the future." 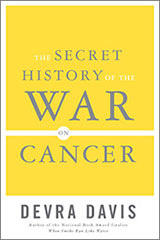 The Secret History of the War on Cancer by Dr. Devra Davis. According to this internationally recognized environmental health pioneer, "for much of its history, the cancer war has been fighting the wrong battles, with the wrong weapons, against the wrong enemies. The campaign has targeted the disease and left off the table the things that cause it. The result is appalling: over 10 million preventable cancer deaths over the past thirty years." "The idea of a girlcott is something I've been advocating for a decade. I originally got the idea from Bella Abzug. The basic concept of economy derives from the Greek word oikos, meaning home. No matter how many jobs we may have outside of the home, and whether or not we get paid for that work, women are the ones who determine what goes into their homes and families and therefore play a critical role in building the economy. Some economists report that women are responsibile for spending 75 cents of every dollar in America today. So, taking this economic power and using it constructively with girlcotts should allow us to create markets for healthier, safer, cleaner, greener products. Bravo to moregreenmoms for making this happen!" 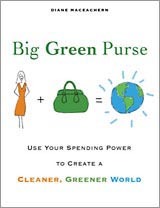 The Big Green Purse by Diane MacEachern. With a similar perspective on the economic power of women to drive consumer demand for safer, healthier products, MacEachern urges her readers to use their clout to protect the environment – and themselves. Her useful book is accompanied by a excellent Web site offering tips and resources leading shoppers to environmentally-friendly and socially responsible products and services. "The Girlcott is an outstanding example of how we can use our spending power to create a cleaner, greener world. I encourage all consumers to take this opportunity to learn more about healthier products and support the companies that offer them today." 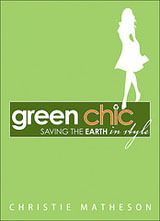 Green Chic: Saving the Earth in Style by Christie Matheson. This easy-to-read book explains why and how to incorporate greener alternatives into all facets of everyday living. It is a great first reference for those who are not sure how to make changes — or why they matter. Matheson coaxes, "Don't be afraid, even if you are a beauty product junkie. Greening your beauty regimen - phasing out some eco-offenders and hazardous ingredients and incorporating natural, biodegradable products that are safe for you (and safe for the planet when they go down the drain) - can help you look and feel more gorgeous than ever." "The Girlcott is a fantastic way to spread the word about the toxic ingredients lurking in so many beauty products...and to send a positive message about taking care of ourselves and our planet."